Mark grew up in Chapel Hill, North Carolina, and has worked in the restaurant industry for more than 25 years as a chef and proprietor. He has always enjoyed gardening, and cooking creatively using the freshest ingredients. Chocolates and Tomatoes Farm allows Mark to combine many passions by bringing sustainable, colorful, delicious ingredients to a local audience of consumers and chefs. 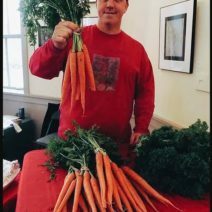 Mark is also a member of the Montgomery County Food Council. You can learn more about him and his farm here.